I had an epiphany last night - The Kite Runner is going to win Best Picture. Not just be nominated, but it's going to win. I may chicken out and recant the prediction as the ceremony draws closer, but I just have this gut feeling that it's going to go all the way. 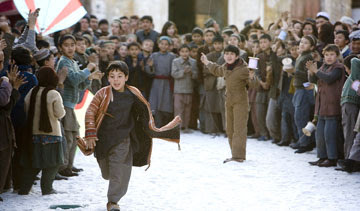 Let's face it, The Kite Runner is the kind of film the Academy loves. It's a literary adaptation with a popular following, and has great social significance without being too intellectually challenging. And it's a tear-jerker...but not in a depressing sort of way. Those last two points carried Crash to a victory over the much more stoic (and challenging) Brokeback Mountain. Making them cry is a BIG asset if you want to win Best Picture (A Beautiful Mind, Million Dollar Baby, Crash). The downside here is that Kite Runner isn't really an "actor's movie," and Crash was, which helped it out with the Academy's largest voting branch. It probably won't see a single acting nomination, which will make it a dark horse candidate. But let's look at the other favorite contenders. Ten years ago, Atonement would have probably cleaned up. Which it may still do, but it has the vibe of a film that the Academy would have fawned over in the 90s...not quite as much now. No Country for Old Men may just be too grim and dry for the Academy...in other words - too challenging. It's the critical favorite, and the critical favorite rarely wins. Since 2000, the critical darling has won only once - The Lord of the Rings: The Return of the King in 2003. Sweeney Todd is a bloody musical about a serial killer...which may not go down well with the Academy's older members...even if it is Sondheim. Of course, the nominations haven't even been announced yet, so I could be totally off here. But something is telling me I'm on to something here...only time will tell.